Learning how to clip your cat’s claws by yourself can be a daunting task. Some cats just don’t take to it very well, and you need a product that’s going to work quickly. In our cat nail clipper buying guide, we will show you what we think are the best clippers for sale. Soon you’ll be clipping your feline’s nails like a professional! Here’s some stuff you should know before you start shopping for a set. 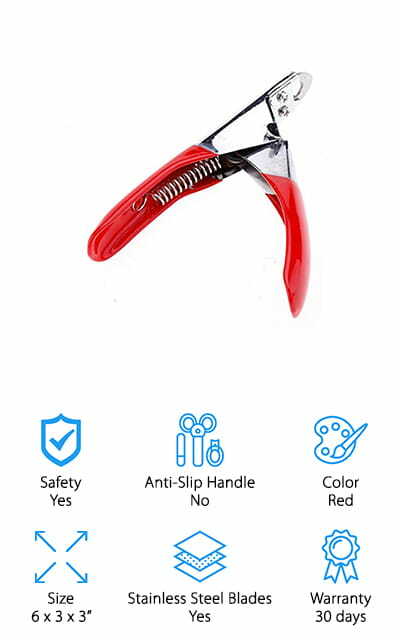 Safety: Some nail clippers have safety guards to tell you where to stop clipping. Line your cat’s nail up to the guard and clip without the fear of hurting them or cutting too much off. It’s a pretty neat feature! 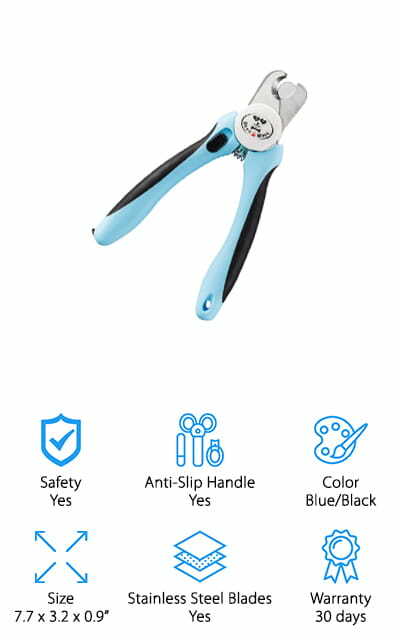 Anti-Slip Handle: When you’re trying to keep your cat calm during the clipping process, you need clippers that aren’t going to slip out of your hands or get dropped. Most come with an anti-slip grip to help with this. Color: This is the color of the clippers. If you’re really into making all of your cats’ accessories match each other, you should keep this in mind. It’s a personal preference at the end of the day. Size: This refers to the dimension of the clippers. If you have bigger hands, you might want to get a set that is a little wider or longer so that you can get your fingers into the holes. Stainless Steel Blades: Stainless Steel blades will keep their edge. This is important so that your cat’s nails don’t splinter, but rather cut clean the first time. They don’t usually need to be maintained, either. They’ll stay sharp. Warranty: If you get a set of clippers that don’t work, you’re going to want to get your money back, or get a product that actually works. A warranty lets you do this within the set time frame. Now that you know what to look for, we can bring you our cat nail clippers reviews! Taking your favorite feline to the vet just to clip nails gets old and pricey when you can invest in a set and learn how to do it yourself. If you’re in a hurry, check out our top pick and budget pick first, because they’ll show you exactly what’s available. Each set is unique, so check out the rest as well! The Epica Nail Clippers allow you to trim your pet’s nails precisely and without worrying about getting it wrong! There’s a guard that will tell you where to cut to, and the semi-circle design will allow you to perfectly see what you’re doing without having to guess. 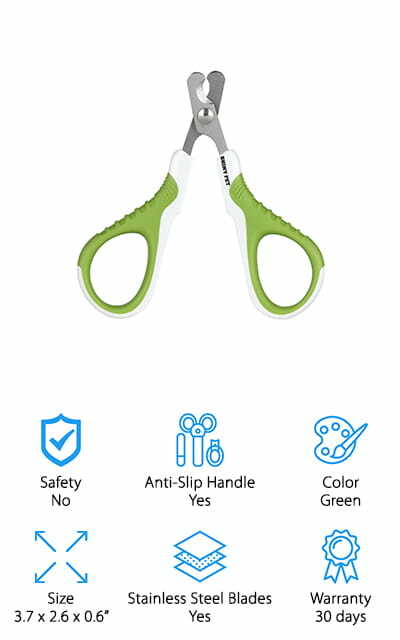 The handles are rubber-coated so it feels comfortable and won’t slip out of your hands, even during tough clipping jobs. When these clippers aren’t in use, they lock closed so you can be sure that they’re safe and no one can accidentally use them! These are the best cat nail clippers for sale that we could find! The blades are stainless steel and will keep their edge for the lifetime of the clippers, so your cat’s nails won’t splinter. You can use them for all manner of other small animals as well – even dogs! And they never require more than a gentle squeeze to get a good cut. Our choice for the best cheap cat nail clippers come from Safari Pet. They are marketed for dogs, but they work just as well for cats. The only difference between them is the size and toughness – dog nails take a bit more force to cut, while cats’ claws are a little more fragile. These clippers are sharp and durable, and they will keep their edge for a long time to come! The safety allows you to cut off only excess nail growth without hurting your cat or cutting down into the quick. It’s a painful experience, so get clippers that will avoid it! It’s a professional-grade trimmer for less, and you can be sure that your pet is getting the best clipping experience. You can use them quickly for cats that are less open to the idea of getting their nails clipped, and you never have to worry about splintering or breakage. We love it! These Pet Republique Clippers are great for not only cats, but also puppies, chinchillas, rabbits, and guinea pigs! The stainless steel blades are nice and thick, and the edge will last without having to worry about maintenance. It’s sturdy, well-constructed, and professional grade. If for some reason you do run into an issue, there’s a 2-year warranty that will help you out! There are instructions on the back of the package so you know exactly what to do, and a guard to make sure that you aren’t going to cut into the quick. Do you want to hear the best part? 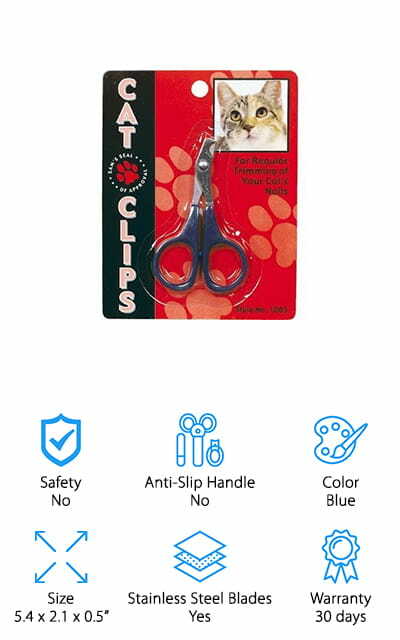 When you buy these clippers, up to 15% of the profits are donated to the American Animal Rescue Society! That’s a pretty sweet deal for anyone that loves animals. So go ahead and give them a try even if you aren’t sure – you have nothing to lose! We love that you can use them on a variety of animals! These SHINY PET nail clippers are perfectly sized for smaller pets, even birds! So if you have any other pets besides your cat, they’re an investment worth making. The angled blades help you get the cleanest, best cut that you can, and they allow you to see what you’re doing while you’re doing it. If you’re just learning how to clip your pets’ nails, this product comes with an eBook that tells you exactly what to do to make the experience fun and rewarding for both you and your pet. The handle is ergonomic and made out of plastic (all from recycled sources). Your hand will not slip off due to the finger-grip areas on the handle. It’s also finished with a slip-proof coating for extra assurance. The stainless steel blades are sharp and hypoallergenic, which is great for pets with allergies. These are the best cat nail clippers reviewed on this list so far! These JW Pet Cat Trimmers are unique on our list because they aren’t the same style, exactly. They will still cut your cat’s nails, and they might even do it better. Instead of having two blades that come together to cut the nail, these trimmers have what is called a guillotine design. All you have to do is put your cat’s nails in the hole, and when you squeeze, a blade comes out of the clippers to chop the nail off. This can lead to a much cleaner cut or at least less risk of breaking. They are suitable for all breeds of cat, and make trimming your pet’s nails that much easier! The handle is non-slip with an ergonomic design so it’s easy to grip. These trippers are easy to use, comfortable to hold, and will do wonders for your cat’s claws. Give them a manicure today with these unique guillotine-style trimmers and experience the difference. These Allary Cat Nail Clippers are perfectly small and sharp, so they will get the job done no matter how much experience you have! They are perfect for the pet owner on a budget because they are less expensive than some of the other brands on our list. They also don’t make the same sound, which can work in your favor if you have a shy or skittish cat. They are really sensitive to the strange sensation, but also to the sound that clippers make when they cut through the nail. This eliminates that sound so they are more at ease. Plus, they work quickly enough that your cat might not even realize what you’re doing until you’re halfway done. If you have a cat that doesn’t like to get their claws trimmed, you can’t go wrong trying these clippers! They might change their attitude without you having to change more than the tools you’re using. 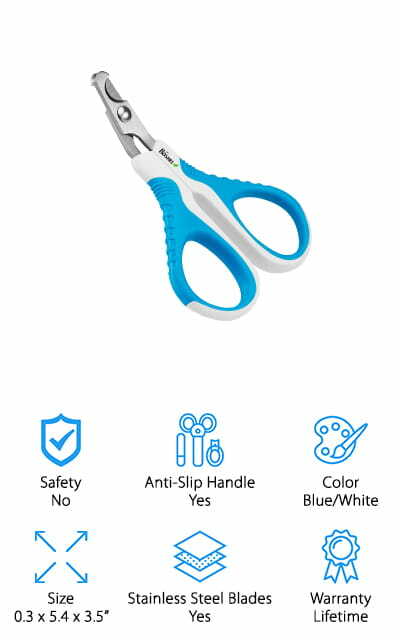 These Bencmate Nail Clippers have premium 3.5mm steel blades that won’t bend or break the nail, but rather slice right through without any issues. 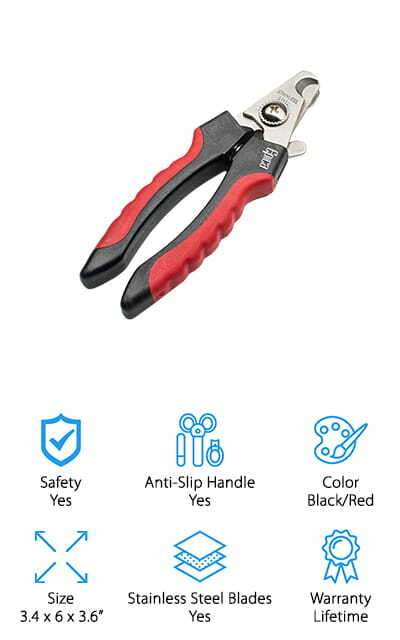 There’s a safety guard on the other side of the clippers so you can properly measure how much nail to clip off without the risk of hurting your pet. They have a comfortable, non-slip ergonomic handle that will let you get a good grip. There’s a safety lock for when the clippers are shut, allowing you to store them confidently that no one will get hurt. It comes with a free nail file. This is stored in the clipper’s handle so you can whip it out really quick and give your pet a great finish on their nails! There’s a hole conveniently located in the top of the handle so you can hang it on a wall! These have got to be some of the best cat nail clippers that we’ve seen! Pettom’s Cat Nail Clippers are designed with you in mind and with your cat’s safety as well! They use spring action, so you never have to apply a great amount of pressure to get them to cut. It’s easy to do with just one hand while you hold your pet or soothe them with the other. They are made of high-quality rubber and stainless steel that won’t lose its edge. For dogs, they recommend cutting the nails right after a bath. For cats, no such preparation is needed! These are large enough to be able to use on both cats and dogs, however, and they work well for medium and even large breeds. 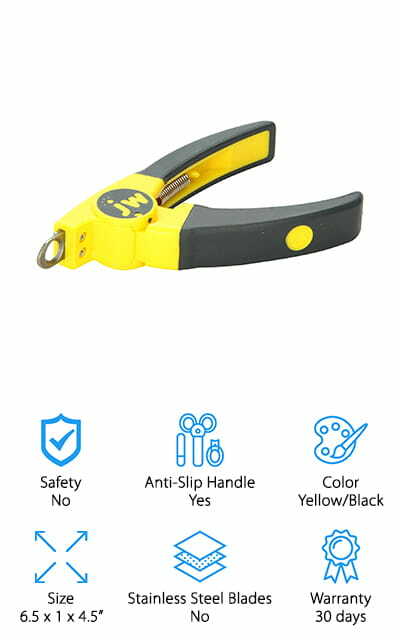 The safeguard on the side stops you from cutting the nail too deeply and injuring your pet. There’s no such worry with the guard on these clippers! We love the spring action that these boast, as well as the high quality of materials! CleanHouse offers a lifetime warranty for their cat nail clippers, which can also be used for dogs and bunnies, as well as other small animals. They have a stainless steel frame that’s covered over by a comfortable grip that won’t slip out of your hands even in tough grooming situations. They come with a safety guard that you can adjust based on your specific cat or dog’s needs, and to switch between using them with cats and dogs. This allows these clippers to be able to work for kittens as well as giant dog breeds. That’s versatility! 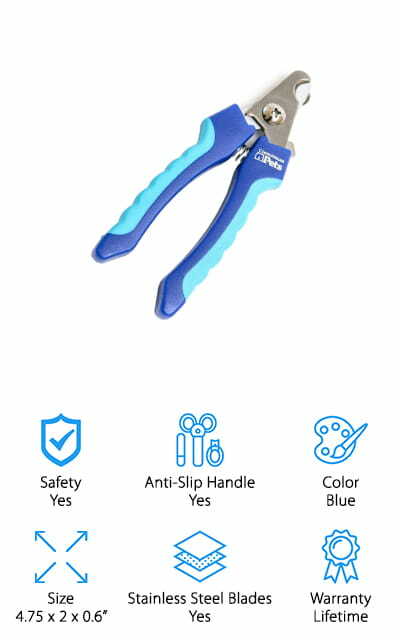 These cat nail clippers with guard piece are really worth the money you’re paying – they’re going to pay for themselves before too long, with reduced trips to the vet and the ability to be used on all of your animals. These professional-grade clippers will keep you and your furry friends satisfied for a long time! They also look pretty nice! The semi-circular angled blades of these Boshel Cat Nail Clippers are pretty amazing, and allow you to see without obstruction. This is important when working with a cat who might be squirming or pulling to get away. 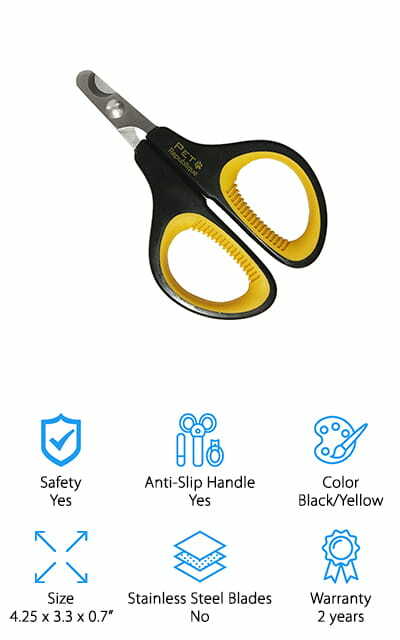 These trimmers are manufactured by a company that is well-trusted in pet care and used by professionals and trainers as well as people at home. It’s so much easier to learn to do your cat’s nails yourself, rather than spending the money to get them cut often. The extra visibility allows you to see where the quick is, and get a clean cut that won’t hurt them. The handles are rubberized and non-slip, not to mention super comfortable. You can use it on birds, rabbits, guinea pigs, and even hamsters. Anything that has claws can get them cut by these professional cat nail clippers! We love how confident the company is in their product – it makes us more comfortable recommending it to you!